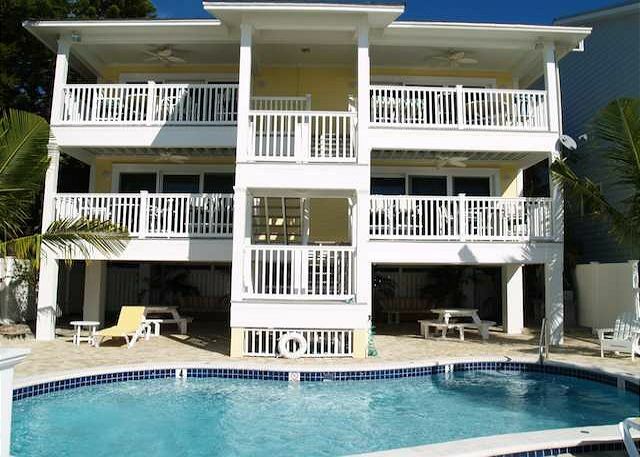 Sunset Villas 1 Amazing pool/deck beach side-BBQ-2 balconies! 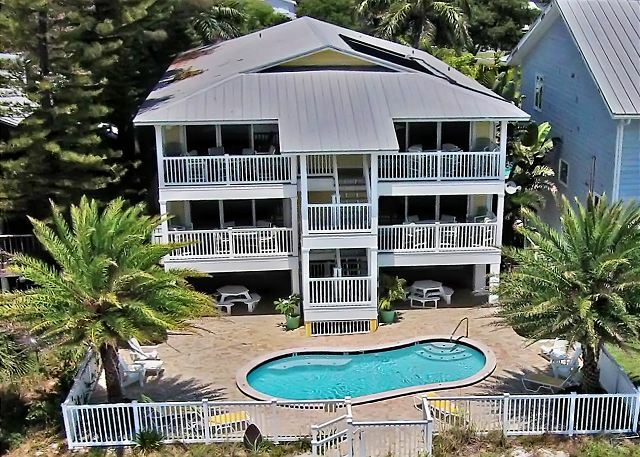 Aerial View - Sunset Villas exterior facing the Gulf of Mexico with pool beach side. Experience true Florida living in this charming beachfront property!! This amazing 2 bedroom, 2 bath condo has an open and spacious living and dining room area, a fully stocked and beautifully updated kitchen with granite counter tops, lovely décor with tasteful colors, tile and wood flooring throughout as well as a lovely balcony right off of the living room. 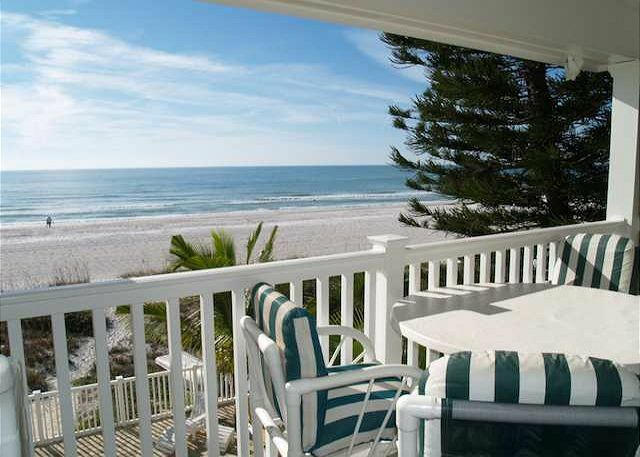 Each condo has 2 balconies for use, 1 off the Master bedroom and the other overlooking the Gulf of Mexico! This location is perfect for a family getaway as there is a park in the front of the property and a pool and the beach in back! Unit #1 is 1 flight of stair up and on the south corner. Come and play on our beaches today!! PLEASE NOTE: This is a totally non smoking property. There is no elevator at this location, only stairs for access. This property does allow for shorter stays at certain times of the year. Please contact us for more details. 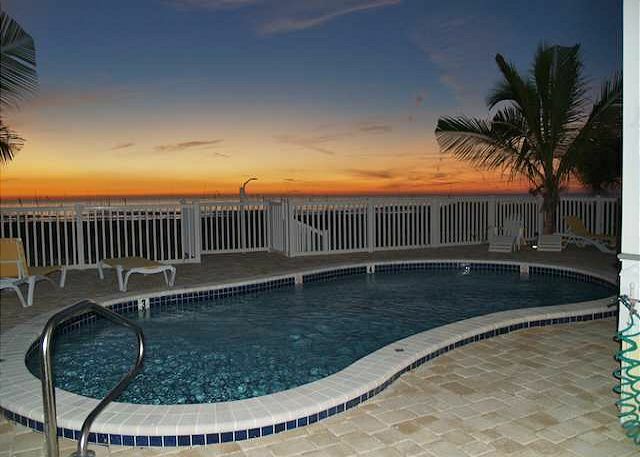 Sunset Villas is a unique and adorable beachfront property in Redington Shores. 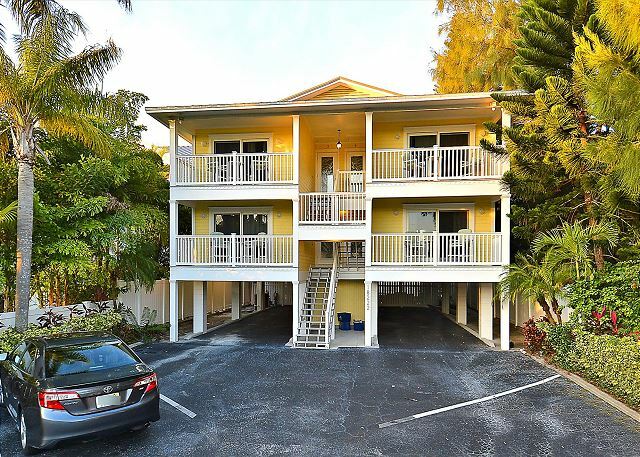 This location has 4 different 2-bedroom, 2 bath units with each having a semi private beachfront balcony from the living room area as well as a private balcony off the front of the condo. Each condo has a comfortable beach décor throughout, individual washer and dryer for use, onsite parking and each sleeping up to 5 guests. 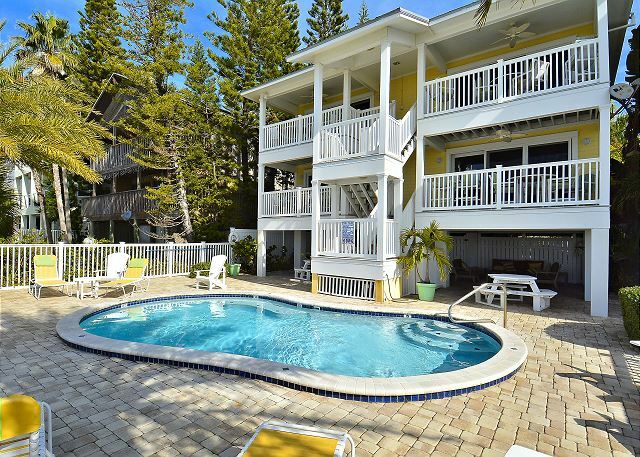 Onsite is a heated - private pool, direct beach access, playground area across the street for the kids, charcoal grill and patio area for those evening cookouts along with everything else that you need for a truly memorable beach vacation. You will find John’s Pass Village approximately 5 miles to the South which is filled with shopping, restaurants, water activities and entertainment for all. Feel like riding some roller coasters while in town? Busch Gardens in Tampa is approximately an hour drive away or hit the Disney parks and all the other Orlando attractions in just 2 hours. The Florida Aquarium in Tampa, Clearwater Aquarium (Home of Winter the Dolphin), Hard Rock Casino, beautiful state parks and miles of beaches are just a handful of reasons to visit our Pinellas County beaches!!! 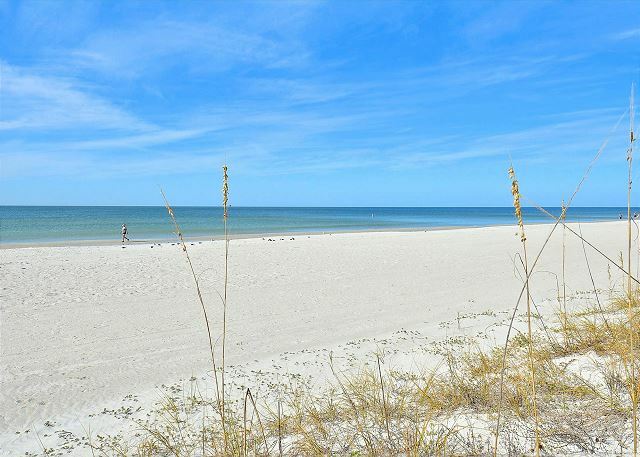 Redington Shores is a quaint beach town that is just a short drive outside of St Petersburg, a city loaded with museums, art galleries, restaurants and shopping. You won’t run out of things to do here!!! Condo was nice.Needed some rugs for entrys etc.There were no amenities such as a beach chair or towels.Plan to bring everything for the beach if you stay.Condo was noisy with upstairs guests and there was little privacy on the deck if this a concern.We were not bothered by this as pictures show what the layout is.Convienent to a couple of restaraunts and shopping near by.Overall a good experience. We had a great time, thanks Resort Rentals! Our family rented all 4 units at Sunset Villas. We had an awesome time. We were all very sad to go. Waking up every morning and looking out at the beautiful ocean front view and walking on the beach was lovely. The water on the gulf was warm and clean. The pool was great and the view of the sunsets were amazing. We were near good restaurants. Our family really enjoyed this time together. The only negative, it is about a 20 minute drive to pickup the keys and drop them off. 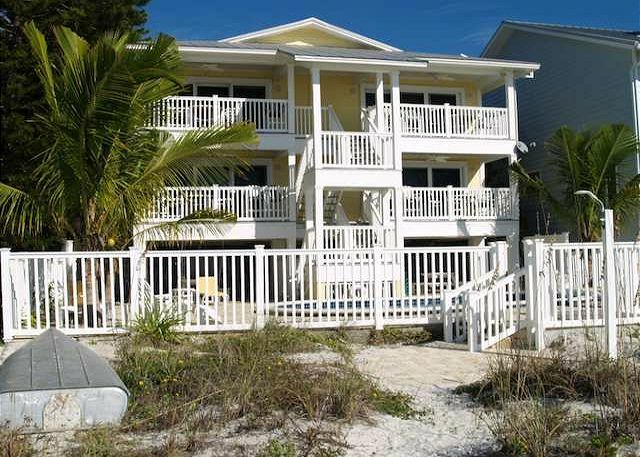 Resort rentals made the booking very easy and responds quickly to any needs. This is our family's 6th return trip and there will be more. So glad to hear you had an awesome time!! Sunset Villas is the perfect spot for this family gathering and we are so glad you all enjoyed. We are sorry if the key pick up and return was any inconvenience with our office being off site. Thank you for choosing to stay with us and we look forward to you and your family back for another visit! Been coming here for years. Management company is very professional and helpful. Looking forward to next year. Thank you so much!!! :-) We always enjoy having you and look forward to your next visit to Sunset Villas with us! Had a great family vacation at Sunset Villas. The place had direct access to the beach and there also was a children’s playground just across the street. The unit was spacious and had everything we needed. We definitely will come back in the future. Great to hear, we are so glad you were comfortable here with your family!!! :-) Thank you for choosing to stay with us and we look forward to having you back for another visit in the future! This is our 6th time staying at the Sunset Villas and we had another great experience. We've stayed in different units in this building and they all are clean, updated and cared for. The building is private, yet is on the beach and has a park on the street side of the building. Resort Rentals does a great job communicating, responding to our needs, and managing the entire process. We will definitely stay here again. So great to hear, thanks for the post! We are so glad all went well and that you were comfortable during your stay here! :-) Thank you for being our guest and we hope to see you back for another visit! We really enjoyed our one week stay in Unit #1 and we hope to be able to return again in 2019 for a longer stay! That is so great, thanks for sharing!! :-) We are so glad you had a good time during your stay at Sunset Villas and we too hope to see you back for a longer stay next season!! It was a great place to get away for our fall break. We love this area and have been coming here for years. Thanks for sharing this wonderful location with our family. You're welcome!! Thank you for staying with us and we are so glad you enjoyed Sunset Villas!! We hope to have you back for another visit soon. Sunset Villas was a very nice place to stay. The location was perfect. We had all the amenities we needed. Dawn at Resort Rentals was especially helpful and nice. We will definitely be going back there. Thanks so much for your post and kind words! 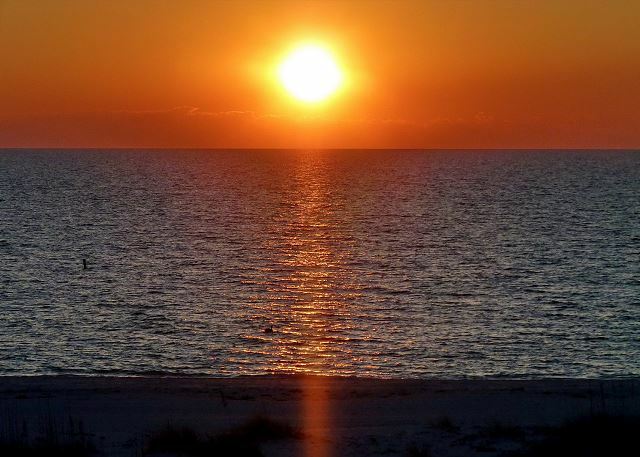 :-) So glad you enjoyed your stay at the Sunset Villas, it really is an awesome beach location!! Thank you again for staying with us, we enjoyed having you and look forward to another visit in the future! Condo was very nicely furnished and modern. View to beach from kitchen very pleasant. My husband, myself and our daughter had a wonderful time. No rain until Friday, then only for a few minutes. Will return again next year if health allows. This was our 5th consecutive year of renting the entire villa. Our whole family, children & grandchildren spent the week together. Super way to vacation together as everyone has their own unit but also the community pool, beach, etc. Highly recommend ! Always a great vacation. Been going here for 12 years. So glad you enjoy and have a great time while visiting! :-) We look forward to your next stay at Sunset Villas! Overall a very good experience. Deck furnature could be more comfortable. Top floor location would avoid noise from above. More sound proofing for the plumbing would be good. Great location. Well maintained. Check in and out was a breeze. Beautiful beach. An electic kettle would be a nice add. Thanks so much for your post and feedback! We are so happy to hear you enjoyed your time and the location (the beach is awesome!) and we will be sure to pass along this feedback to the owner for review. Thank you for choosing to stay with us and we look forward to your next visit!! a guest from Edwards, IL does not recommend this vacation rental. Great stay. Weather was fine. Mostly ? ?Sunshine entire stay. Noisy neighbors above us. Thank you for the post! The weather this season really has been lovely!! :-) We apologize if the guests above you were noisy, we understand the frustrations with that. Please do not hesitate to contact us at our office, we are happy to help however we can. Thank you for being our guest and we hope to have you back on our beautiful beaches again soon! This was our third year to stay at this property. We love the location and the privacy. The place was clean and fairly well maintained. It could use some updating. The wallpaper is old and starting to peal in places. The chair is made of feathers which seem to come out all over the place. The shower curtain in the master bath needs to be replaced. There needs to be a spatula and scissors in the kitchen. It would be nice to have a TV in the master bedroom and more chase lounges at the pool. We rented both unit 1 & 2. Unit 1 did not appear as clean as unit 2. Found mildew on toilet seat and a used bar of soap left in shower. Ice-maker did not work!! Huge problem for us when staying at beach. Fortunately unit 2 ice maker worked. Both kitchens were lovely and stocked well. The mirrors in living and dining area are a little dated in my opinion. However these little things are easily overlooked by the awesome location and close proximity to the beach. Outdoor balcony seating was wonderful as well as the pool area. We would definitely return to Sunset Villas! Thank you for your post! We do apologize if the ice maker was not working properly for you during your visit with us, and for the bathroom items you mentioned! Thank you for calling us while you were here and letting us know so that we could correct this for you. We want to be sure you are completely happy and comfortable during your stay and we appreciate you letting us know about these issues. We are so glad you enjoyed the beach location of Sunset Villas, it really is a beautiful spot!! :-) Thank you for being our guest and we hope to see you back on our beautiful beaches again soon! We visited Redington Shores in October 2016 and stayed at Sunset Villas Unit 1. 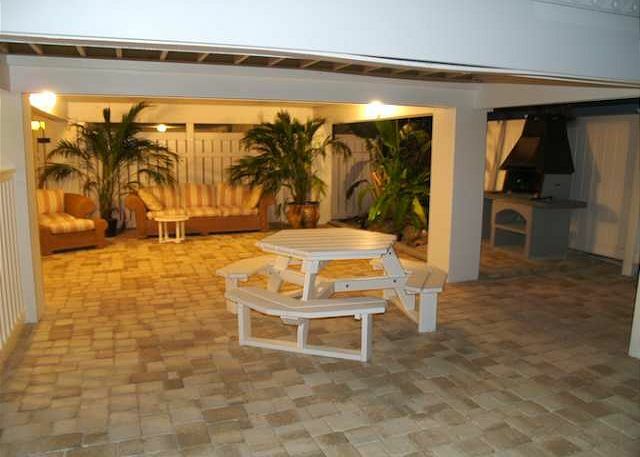 The property was very well maintained and clean. We were very satisfied with the decor and accomodations. The view from the unit was beautiful. 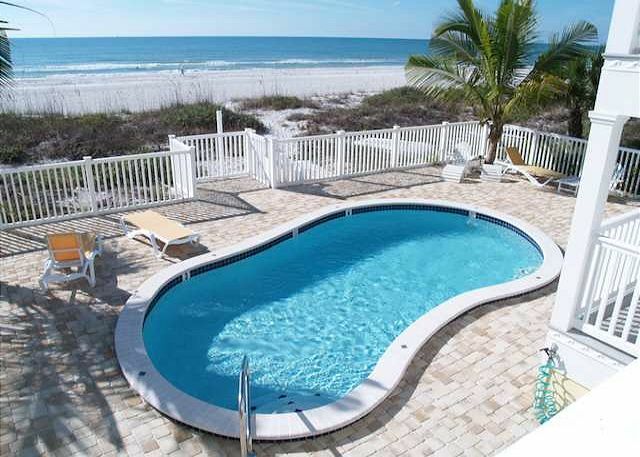 We would definitely consider this unit for any return stays to Redington Shores! Thank you so much for your post and we are glad to hear you enjoyed your stay at Sunset Villas! These condos are very well maintained by the owner and we are so glad you appreciate that along with its beach location!! Thank you for staying with us and we hope to have you back on our beautiful beaches soon!! We were able to rent all 4 units with family and friends. The units were comfortable and spacious. The pool was very relaxing and just to be able to walk right on the beach and enjoy a sunset at night was terrific. We had fun playing board games at night, opting for eating in instead of going out. The barbecue being there also was convenient. My family has been coming for at least 9 years. The friends we invited to join us this year are planning on coming back next year with family. Definitely would recommend Sunset Villas. Thank you so much for your post! We are so glad you had a nice stay at Sunset Villas with your family and friends! Sunset Villas is an ideal set up for vacation groups to allow them to be together, yet everyone can still have their own private space, it's perfect! :-) We are so glad you enjoyed it all and we look forward to having you all back for another wonderful beach vacation!! Great place,only bad experience was owner came walking into pool area unannounced and was very rude. I have never had an owner walk in/ pop in on any rental I have ever rented. Very Unprofessional. Another great stay at Sunset Villas. Both the indoor and outdoor space work so well. The privacy of the beach is great! Park directly out back is a huge bonus for the kids. First time on Redington beach for us and we thoroughly enjoyed the experience. Sunset villa is ideally placed for beach access and the sunsets, and is also spacious and comfortable. Enjoyed Seabreeze Grill, Crabby Bill's and Aqua Prime for food. Fantastic view, many updates have been completed and a few more will make this a stunning getaway location. With only 4 units, this is very private; however, a noisy & rude neighbor made for a less than pleasant week. Thank you for your review! 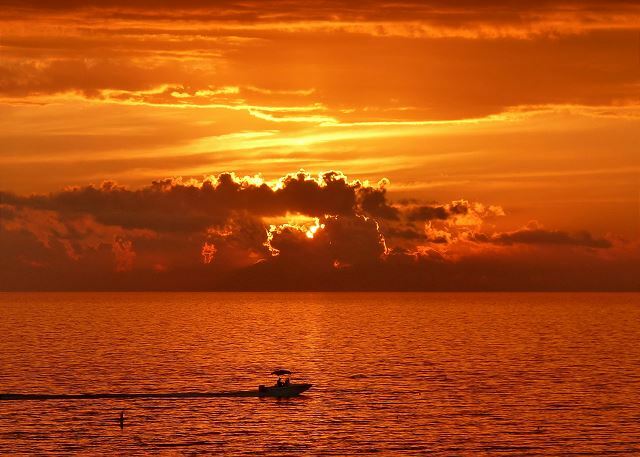 We are so glad you enjoyed the fabulous view at Sunset Villas! Although it feels like a private getaway, there are 3 other units on the property. We do our best to rent only to quiet, respectful clients, however are unable to know if someone has fooled us. We apologize for any issues you had there, and would have had no problem addressing someone who is causing an unpleasant vacation for you, had we known about it. We look forward to having you back again at Sunset Villas next year! It was and has always been a wonderful experience. I would recommend this property to anyone. Wonderful location and clean. One week stay in Unit 1, first week in May. This was our second time at Sunset Villas and this time our inlaws joined us. We were in Unit #2 and they were in unit #1. Both places were very clean and comfortable. We liked some of the upgrades from the previous year (kitchen, king size bed, etc.). We really enjoyed the location right on the beach and had fun BBQ'ing and swimming in the pool with our two young kids. We'd highly recommend this spot and will be back soon. This was our fourth time staying in this condo. We love the location and the size of the property. Plan to return yearly. We rented the unit for five weeks in March. The condo was in good shape, cleaner than last year, and the kitchen reno was great. The owners do a great job repairing and updating the condo. We found it to be very well equipped and comfortable. Location amazing! Resort Rentals is a great company to deal with. Any concerns were dealt with immediately. They were friendly, and very accommodating. Our first two week stay was awesome as the other units were occupied by adults. Our only concern was the number of children in the other units for the last 3 weeks of our visit. The families, for the most part, were very nice, but children being children, were very noisy and often times we could not sit outside because of it. Too loud for us. It's a lot of money to spend on a vacation when you have to hang out inside and can't enjoy your deck on beautiful days. It is not the fault of the children or their families, it is a result of the condo set up. I would recommend the condo, but be aware that you may be sharing the property with lots of kids! Thank you for your review. I am pleased to hear that the first part of your stay went so well. I do apologize if the neighbors were not respectful of your space. Next time please do not hesitate to call us if this is happening. We can definitely ask tenants to abide by the property rules so all of our guests can enjoy their vacations. Again, thanks for your review. We look forward to seeing you next year! Why do we come only once a year ? Wonderful, this was our 3 year and our granddaughter asked the question, why do we only come once a year? We look forward to it all year long. It was a very relaxing and peaceful property and location. The condo was very roomy and comfortable. It was just like being at home. I loved the comfortable chair with foot rest. I could have and almost did sleep in it all night. Everything was exactly as pictured. It was so nice also having the pool for a break from the beach. The only negative thing was not having any chairs to use at the beach. I'm hoping that each unit in the future can have at least 2 beach chairs for each unit available on each porch. Thanks for your great review! I am glad you enjoyed your stay. I appreciate your suggestion and will pass it on. Just so you know for the future, we have a limited supply of beach chairs and umbrellas available at our office. They are on a first come first serve basis. If you find your condo does not have chairs you can pick up 2 chairs and an umbrella for your use while you are here. We do ask you leave a $50.00 cash deposit but we will refund it when the chairs are returned. Hope to see you next year! 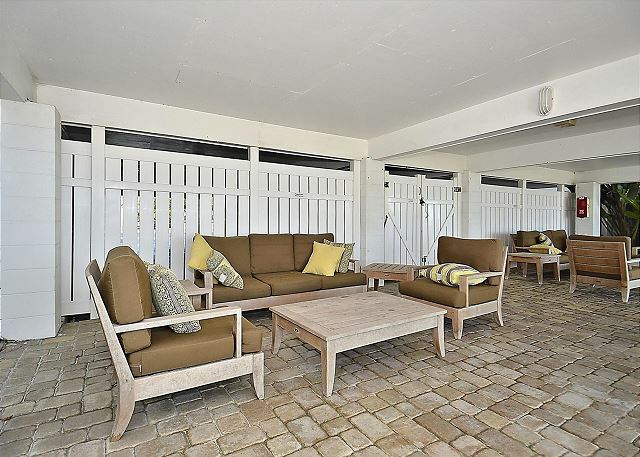 This condo is in a great location and has great views with easy access to the beach. The unit was very clean and well equipped. While the unit was clean, I never saw anyone attend to the pool during our stay and it needed a good cleaning. The pool deck area also needed to be cleaned up as the occupants from the previous week left a large amount of beach toys scattered around the pool. We also had 3 different mainteance/contract workers show up to do work. 2 of the 3 were unannounced and didn't really seem to care that we were on vacation. Overall we had a great time and would stay here again. This was our third stay in this condo. Love the area, great location. This condo needs a new couch and mattress in the master bedroom. other than that, great place. We will be back! It would be nice if you could leave the keys to the unit instead of having to drive them back to the rental office. While the overall assessment of our stay would be in the "completely satisfied" range--we have booked for next year, the cost for cleaning must be a "token" effort as we spent an inordinate amount of time making the condo shipshape. Floors and furniture required a thorough cleaning and the furniture could use an update. Resort Rentals staff was superlative in helping with what were very minor problems. In total, a great vacation experience in a great location. Enjoyed, but a little noisy on that lower units. Would also like a more convenient way of returning keys rather having to drop off at office. "What did you like best about our week at the beach?" Sydney (7 yo) said," No, really, JoJo, EVERYTHING was great !" This rental is very well located. Relatively quiet area of the beach with easy access to shopping and dining. My only complaint would be that the unit needed more seating options in the living room. However, I'm already making plans to stay here again next year. I have nothing but positive things to say about the condo and its location. it was a great unit for families with children. My sister rented the upstairs unit so we had the whole family. The pool was perfect and very secure. We had a great time and look forward to booking again. The beach and pool access are wonderful. Some noise from the people in the unit above. The unit was clean but furniture is worn. But, who comes to the beach to sit inside. Kitchen needs to be updated. We have always had a good vacation,using Resort Rentals. Will be back next yr.
We love the location of the condo. Very quiet, nice pool, had everything we needed. This was our second stay in the same condo. We will stay again. Great vacation! 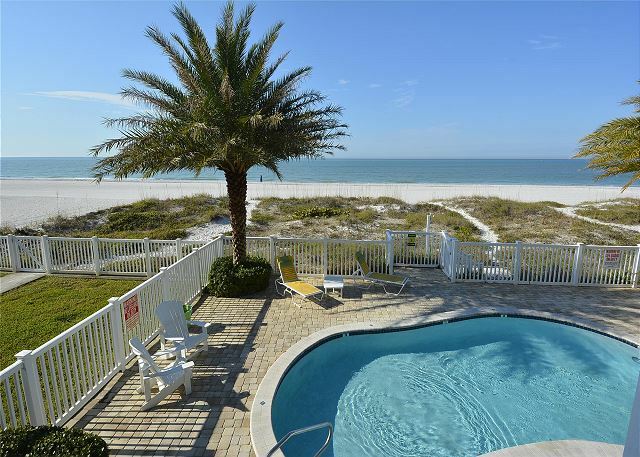 The best thing about this condo was the easy a fess to the beach. Felt more like a beach house than a condo. Didn't have a garbage disposal and the dryer took hours to dry a load. Other than that it was great and I would go back. Our vacation was very enjoyable as our friends rented villa #2 right beside ours. The only problem was 5 or maybe 6 young girls were in the villa above us. The noise at night was terrible as they ran around late at night screaming and singing, sometimes as late as 3:00am. The pounding on the floor as they walked around was unacceptable as we were trying to sleep. We would come again as the beach is beautiful. Just don't rent to those girls again. This is our 2nd time to Sunset Villas. Will come back in the future for sure. Great location, great beach! Unit was much cleaner this time, compared to last year when we visited. We were very happy about that! Unit could use some updates to freshen it up, but that isn't really a deal breaker for our return! GREAT TIME! Although too bad the weather can't be controlled. It was cooler this year, compared to last!! All in all, wonderful trip! in spite of the work being done on the beach, we were quite satisfied with our accommodations. The unit was very clean except for the tiled floors which could use a deep cleaning. We had a very relaxing and enjoyable week. 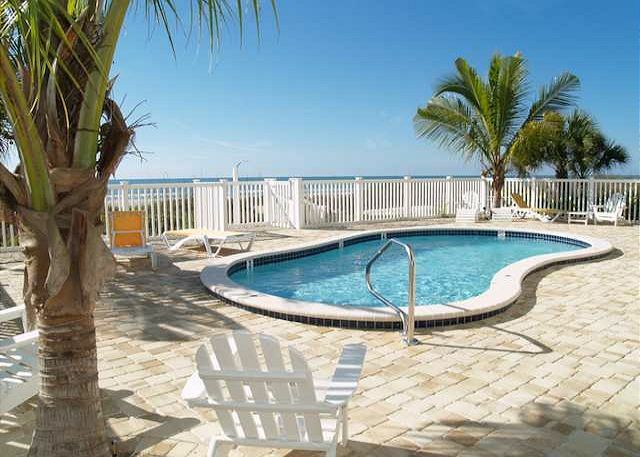 On our next visit to Florida, we plan on staying at the Sunset Villas. The sunsets were beautiful. Relaxing every morning with a cup of coffee on the deck looking at the ocean was terrific. The convenience of the pool for overseeing children added to the overall experience. Would and have recommended Sunset Villas to friends. I am a returning guest and will be back. Overall it was outstanding as it is every year we stay. We love the location and size of the units. Only drawback is units Need TVs in all rooms. Thanks so much for your great review. I will pass on your suggestion to the owners. I am glad everything else was enjoyable. As a family we rate our vacation stays based upon others we have already experienced. This helps in deciding where next year's vacation will be. Of all the East Coast and Florida rentals we have been to, this one rates in the top two. Everything was as it was described and you could not hear the neighbors. It made enduring Tropical Storm Debby much easier. The beach location, as well as proximity to shops and eateries, was great. While nothing is ever perfect, overall we were quite pleased with this vacation rental. My family of four, 2 teenage daughters, needed a week together in the sun and the property location, amenities, community and beach surpassed all our expectations. 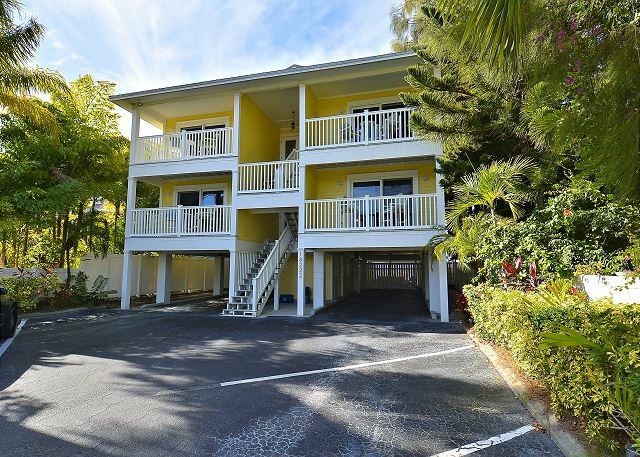 We watched sea birds, dolphins, surf, and beautiful sunsets, played in surf, soaked up the beautiful sun, admired the sea bird and turtle nesting areas-- all 120 feet from our spacious and well appointed 2 bedroom, 2 bath condo. We loved every minute of it. The management team's responded to a small issue with air conditioning immediately without any interruption to our day. We could not have been more pleased with the entire experience and would recommend this property to any and all our friends! Loved our stay overall. One thing that really bugged us was that there was no recycling service. Having to tranport our bottles/cans on vacation was not so pleasant. Glad to hear all went well during your stay. Slowly but surely our city is catching up and starting to offer recycling pick up. Hopefully by the next time you are here it will be available at the Sunset Villas. The property is very nice and spacious. We loved being right on the beach and the pool was great (not very many properties have a pool). We could let the kids go out to the beach and hear them playing from the condo. I thought the condo was well maintained, though, the floors made my kids feet turn black when they weren't wearing shoes. Overall, it was great quality for the price and we would definitely come back. thanks so much for your great review! Next time you are here, please call if you have any cleaning issues. We have no problem sending the cleaners out to revisit the property if something is not right! The view was wonderful and the kids loved the pool with plenty of seating for all. The kitchen needs a little update and there were no sheets that fit the pull out sofa but we used some twin sheets and the kids did not even notice. The trip was wonderful and there are plenty of places to go and see that are not to far away. We will surely go back. and on the ledges. The ceiling fans had a thick layer of dust on them as well. Although the main areas were clean and tidy, I think the unit needs a more thorough cleaning. Otherwise a very enjoyable stay! Thank you for your comments.... We apologize for any inconvenience and we forwarded those comments to the cleaning company! Next time you encounter any problems, let us know and we will try to remedy the problem when you are here! We (a family of four with two boys aged 8 and 10) stayed for a week around Easter. We had a fantastic time: the location is wonderful, the pool was excellent, and the apartment had everything that we could wish for. When we noticed that there was not enough cutlery the management reacted very quickly and professionally - excellent service. We were amazed by the beautiful beach, the amazing nature and loved the fine weather. The kids played in the pool for hours on end and were impressed by the big TV. We liked using the gas grill too. All in all, a perfect week that we would love to repeat sometime soon. Great pool for small children. Nice kitchen. There was considerable dust under the beds and furniture, but otherwise was pretty clean.